Mike’s Reef is an untouched aquatic paradise where the clear waters make for a post-card worthy experience. The reef was made popular by Captain Mike Hagedoorn who began chartering people to the paradise in 1977 when he founded Tranquillo Aruba. To get to the reef, you will charter a boat from Oranjestad which will take about 45 minutes to dock. Captain Hagedoorn pioneered a kind of snorkeling called “drifting” where divers do not have to use their fins for movement as the current propels them along. If you take a dive on Mike’s reef, you will see the ocean floor at about 100 ft below you and hundreds of transparent and multicolored creatures swimming through unperturbed. The Antilla is recognized as the largest wreck in the South Caribbean region. It was constructed in 1939 in Hamburg, Germany and launched in the same year. In the course of the 2nd World War, the Antilla, at the time carrying a German crew, was almost confiscated by the Dutch. The crew opened its valves to let it sink instead of giving it up to the Dutch. The ship sunk in shallow waters at 45 ft and parts of it lie just below the surface. It spans over 400 ft long, and it encourages penetration because of its large compartments. The middle part of the ship has the explosives that were used to sink it. The Antilla is home to numerous tropical fish, spectacular coral formations, and stunning tube sponges. Hundreds of tourists flock to this wreck making it among the top 10 scuba dives in Aruba. Another casualty of World War II was the ship Pedernales. This Italian-built tanker was sunk by a German submarine in the Caribbean waters. The middle part of the ship is what remains, and it lies 25 ft of water from Antilla. The depth of the Pedernales is about 26 to 30 ft. The wreck supports a vast pool of life including moray eels, grunts, snappers, angelfish, grouper, silversides, and octopus. The waters over the Pedernales are almost always calm making it perfect for snorkeling and shallow dives. Renaissance Island’s ownership lies with the Renaissance Resort. The island is popular for its airplane wrecks and a harbor reef with a sunken tugboat. One of the airplane wrecks lies at a depth of 39 ft and it was the first twin-engine aircraft to feature a pressurized cabin from the American-based manufacturer Consolidated Vultee Aircraft Corporation. The airliner was broken into two by the 1999 Hurricane Lenny although the cockpit and some components of the hull are in good condition. A few breaststrokes from this wreck lies the remains of what used to be a YS- 11 passenger aircraft. The wreck makes an excellent artificial reef with its stern resting 82 ft deep. Hole in the wall is a varied dive site with a few entry and exit points. You can dive into the water from the jetty or via the beach. This site is especially recommended as a night dive spot. You can dive with the sea waves past the narrow reef tract to Mangel Halto which is a bowl-shaped dive site harboring the remains of a tugboat. The underwater realm of the Mangel Halto is surprisingly calm considering the currents on the surface. There is also a shaded beach ideal for snorkeling or picnicking. The Jane C Wreck was once a 190 ft beauty when it was launched in 1959. Numerous stories abound her use including cement and cocaine. It was sunk in 1988 by local dive operators in an upright manner with her bow facing Palm Island. Her depths range between 50 to 90 feet. The ship lies close to the reef, and its coral growth attracts fish and other marine creatures. The cargo hull is open to the surface making penetration easy. The Serito Pinnacle is not only one of the top ten scuba dives in Aruba, but it is also among the best keep secret among diving enthusiasts. It lies unspoiled on the southern side of Aruba, and the only opportunity to get to the pinnacle is via a private charter. Divers relish in the occasional strong current as it brings a host of marine life including species of jack and barracuda. You can bet on viewing the elusive Manta Ray. There are only a few opportunities to visit the pinnacle year, so the pinnacle remains almost virgin. The SS California is often misrepresented as the Californian, famously known as the ship that received the Titanic’s distressed signals but did not respond. This unidentified wreck is however interesting to explore. It lies 15 to 30 ft in depth, and it is especially ideal for underwater photography. The SS California lies on the southern edge of Aruba which experiences occasional strong currents. If you venture deeper past the wreck, you might spot hammerhead or bull sharks. Pet Cemetery lies east of Baby Beach, and it got its name from the numerous pets buried there with handmade crosses and headstones. There is a wide reef tract that runs along the shore of the Pet Cemetery featuring various species of finger and pencil coral, mustard-hill coral, elkhorn and staghorn coral, and sea fans. 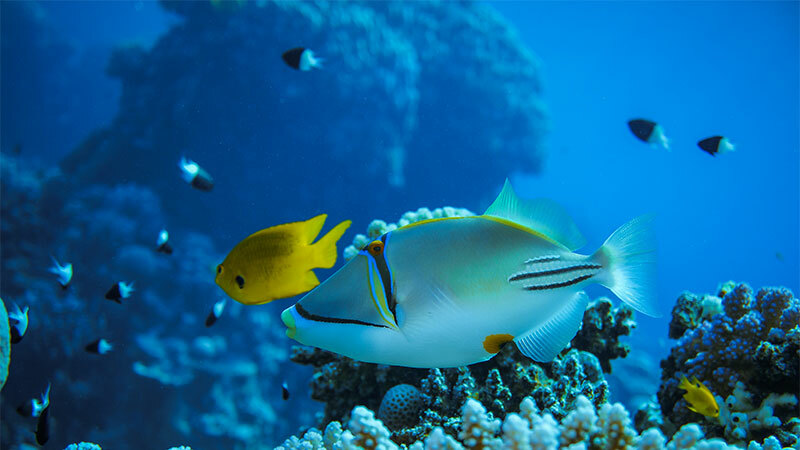 The reef extends past Baby Beach becoming narrower and steeper and hosting populations of triggerfish, sturgeon, cowfish, damselfish, and gobies. Another of the top 10 scuba dives in Aruba is The Wall where you could dive for days and even weeks and not exhaust the marine life that can be seen here. This stunning reef is home to numerous green turtles who inhabitants it during their egg laying season (May-August). When you dive down the steep wall, you will be treated to a beautiful visual of gorgons, groupers, burrfish, and moray eels. The coral formations present here include black coral, ribbon coral, star coral, and flower coral. Among the marine life inhabiting The Wall are jackknife fish, damselfish, and porgys. 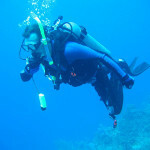 I'm a practicing Civil and Structural Engineer and I love to scuba dive. 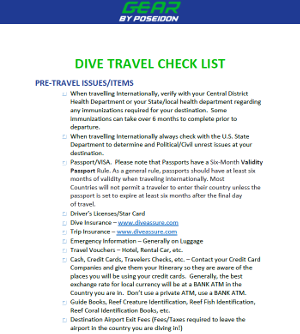 Print our FREE Dive Travel Checklist! * You will follow up emails with practical diving advice. You can opt out of these emails at anytime.